There now. Isn’t your day instantly better? I don’t even need to do an opener this week, because MORGAN FREEMAN being RIDICULOUS is enough, right? 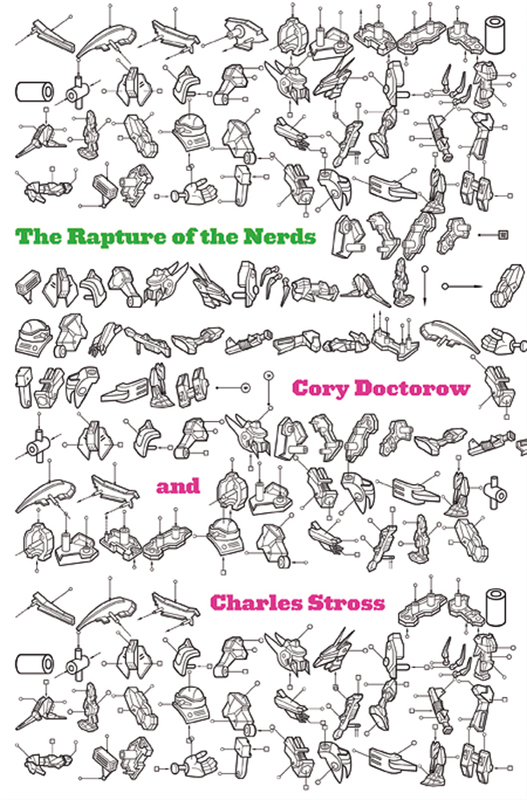 None of this week’s genre releases really captured my eye, but the one that came closest was The Rapture of the Nerdsby Cory Doctorow. It’s a tale of humanity in the future, when most of us have left the planet for the stars, and traded in our humanity for technological upgrades. Described as “a tale of the singularity, posthumanity, and awkward social situations,” it seems tailored for our generation. Might be worth a read. This month, as the first anniversary of DC Comics’ epic reboot, sees the release of the “#0” issues – which look to fill in a bit of the back story of the new status quo. Since I couldn’t pick just one, here are the two I think look most intriguing. 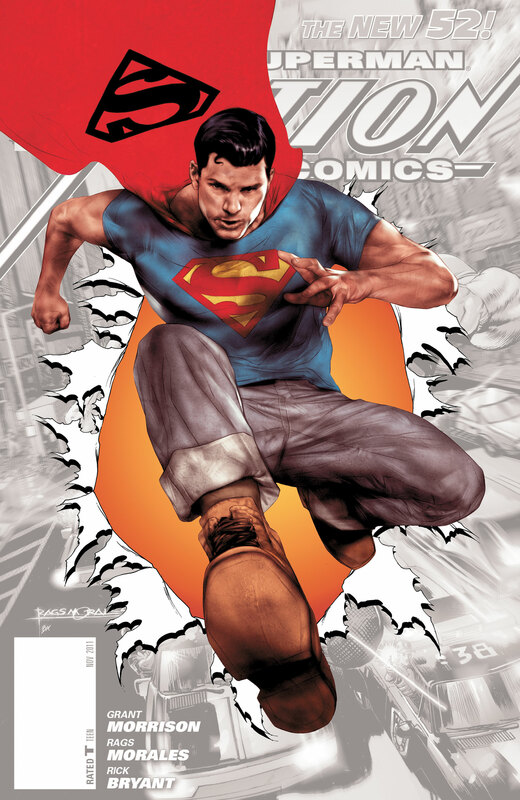 Action Comics #0 – The tale of how Superman got his start. We should see how he came to Metropolis, how he was inspired to fight crime, and maybe even how he met Lois and Jimmy. Green Lantern #0 – I’m years behind on Green Lantern by now, but I’m still hearing tons of buzz. There’s a new mysterious GL in town, and now we get to meet him. This should hopefully raise some new questions and answer some old ones before the next sprawling epic – “The Rise of the Third Army” and Hal’s destiny as the greatest Black Lantern. Jack. Crap. It’s depressing really. 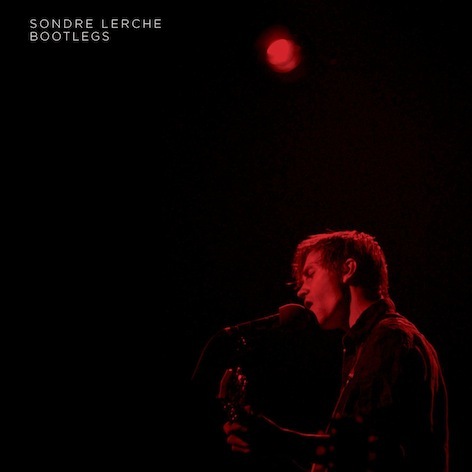 Sondre Lerche – my boy from Norway – has a live album out this week! In general I don’t prefer live albums (I want my albums to sound perfect, and my concerts to sound live), but I may be willing to give this one a try. The guy’s music is fun and off-beat, and really chill. I feel like this video captures his sound and style pretty perfectly, so give it a watch and see what’s up! Now that Breaking Bad has ended – and what an ending, post to come – for the year, there’s only one show on my heart, mind, and TV – DOCTOR WHO! To be honest, I wasn’t a big fan until this summer, when I got caught up on the Matt Smith/Steven Moffat era, and absolutely fell in love. This season’s opener wasn’t my favorite (Daleks ugh), but I intend to treat each episode as precious because these are the last ever episodes with Karen Gillan (my future wife) and Arthur Darvill (my future BFF). Plus, this next episode on Saturday? 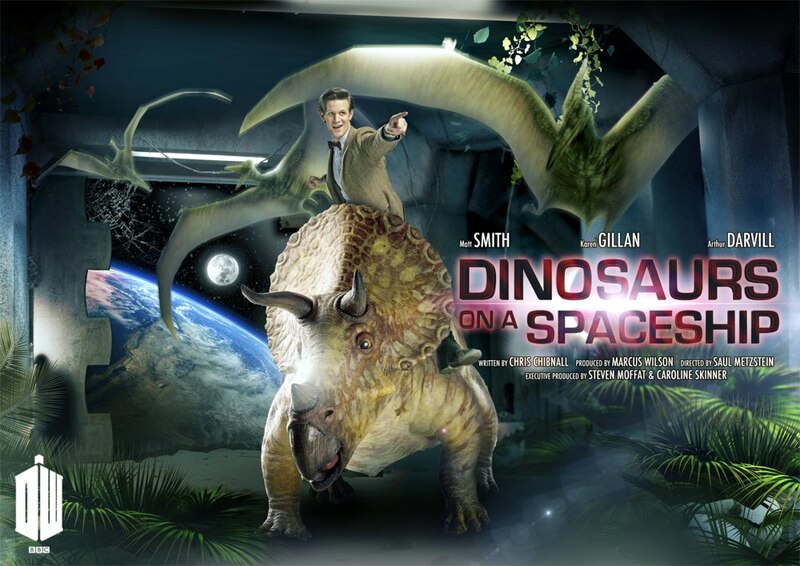 DINOSAURS ON A SPACESHIP! And that’s it for the week. Those are my recommendations, take ’em or leave ’em. I hope to have a post on this half-season of Breaking Bad on Wednesday or Thursday, and hopefully a post from Stephen on Friday! Have a great week all, and do something to enrich yourselves! Read a book, go for a run, learn something new. Or don’t! Whatever! I tried to avoid it. I really did. I sat down at the computer to write a nice little piece on the recent developments concerning a Justice League movie*…but then I saw it. By “it,” I am referring to the reports that Warner Bros. is pursuing a film option based on “The Guinness Book of World Records.” Yes, THAT Guinness Book of World Records. I don’t like to write this sort of negativity too often because, after a while, it just sounds like an old man sitting on his porch yelling at kids to get off his lawn. But every now and then, you read a movie synopsis and think to yourself, “That is literally the dumbest idea I’ve ever heard.” Today is one of those days for me. Great movies are too few and far between these days. What happened to the skilled screenwriters, auteur directors and movie execs who knew how to take a risk? Hollywood’s been all about the money for decades, but at least there used to be a few more bones thrown towards those who enjoy quality films. Before this rant goes too far overboard, I’ll cut myself off and just say this: similar to politics, theatergoers vote for the kind of movies they want to see every time they stand in line at the box office. Stay informed and use your $10 wisely, or else we’ll be stuck with knock-offs like “Battleship” til the end of time. * – As for the Justice League movie, it was confirmed this week that writer Will Beall (this year’s “Gangster Squad”) was hired in 2011 to work on the upcoming script. While Beall hasn’t done much to date, he is currently working on the “Logan’s Run” remake and “Lethal Weapon 5” for Warner Bros. More good news comes from the fact that both Wonder Woman and the Flash should be getting their own films in the next 2-3 years. Unfortunately, three of the writers from “Green Lantern” are helming those scripts as well (because it’s always good to pull the talent from a project that cost you $100 million last summer). Of course there are still hundreds of questions left to answer before the Justice League is assembled on screen, but it’s nice to know that Warner Bros. is trying. So yesterday I talked about DC’s New 52 – DC Comics’ historic rebooting of 52 of their comics, from Batman to Aquaman. In case you didn’t read, the general gist was that I found the whole idea somewhat frustrating. Comics blame their increasingly poor sales on the inaccessibility of the books rather than their quality – or better yet on their COMPLETE LACK OF MARKETING. I didn’t really address that point actually. But this guy does it better. All that being said, I was really intrigued by this relaunch. I mean, how could you NOT be? Or at least, how could I not be? One of the main selling points for me was that Grant Morrison, one of my favorite comic book writers of all time, would be writing Action Comics, telling the new story of how Superman got started in Metropolis. I was also eager to reconnect with the Green Lantern franchise after hitting budgetary and emotional burnout with them during all the hype for the big movie. So, let’s talk about the New Issue #1s I picked up. To be totally honest, I was pretty disappointed by the first issue of Morrison’s run. I mean, I liked seeing a Superman that was reckless, arrogant, totally vincible, and running around in jeans. I also liked seeing a Clark Kent that was just as concerned about justice – a young, crusading journalist and blogger, exposing corruption in Metropolis. But otherwise, the origin felt pretty by-the-numbers, and hardly revolutionary. By Issue #5, however, I am singing a totally different tune. Having seen the destruction of Krypton – which was very Last Days of Rome, the story of the Kents, the reveal that Brainiac is now the A.I. to Superman’s ship, the sacrifice of Krypto, the Phantom Zone criminals, and the mysterious time-travelling villains, I am really intrigued, and newly confident that Morrison has got tons of story to tell. The Green Lantern franchise was pretty solid before the relaunch. In the hands of Geoff Johns, how could it not be? This man almost single handedly transformed Green Lantern from a fringe comic into one of the mainstays of the DC Universe, in terms of creativity, critical review, and sales. As a result, pretty much NOTHING has changed from before the relaunch. Except that all that history has now taken place in five years rather than ten. So, Hal Jordan has been stripped of his ring. He’s struggling to lead a “normal” life, messing it up at every turn. Sinestro has been given a ring, and he’s equally unenthused. So obviously, they team up, with Sinestro loaning power to Jordan – that he can take away at any time. I must say, I was intrigued by the sort of buddy-cop vibe going on here, as well as the role reversal. But it never really GRABBED me. Maybe this is just GL-ennui from the movie, maybe it’s my very strapped budget, maybe it’s that I find Hal Jordan unbelievably boring. Obviously it’s all three. So I dropped it with a twinge of regret. GLC was one of my favorite DC books for a while. It was more of an ensemble book than Green Lantern proper, and was also unabashedly weirder. The artist was unparalleled in creating horrifically bizarre aliens from the edge of space, and the author was a master of capturing different voices and telling stories with both action and resonance. But again, nothing really captured my attention this time around. And with the reboot being so hyped, I felt like that was really crucial. OK, so out of the FOUR Green Lanterns from Earth, Kyle Rayner is arguably my favorite. Maybe. Guy Gardner is hilarious. And Kyle’s mask is DUMB. 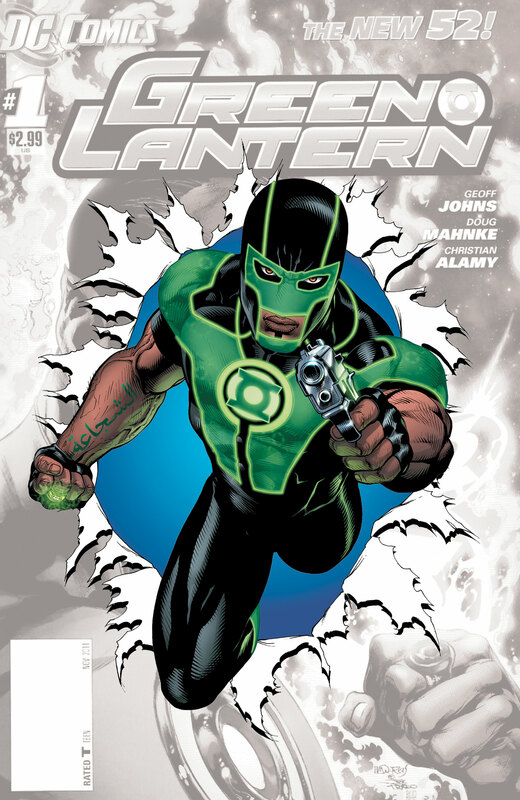 But he’s been the main Earth Lantern most of my comic book life, so I have a sweet spot for him. For a while, New Guardians looked like the GL book for me. I mean, the concept was intriguing: Kyle Rainer all of a sudden finds himself with seven different colored power rings, transforming him into a nearly god-like entity. This in turn threatens the other 6 Corps, as well as his own god-like bosses. I really did like it, despite dropping it mainly for budget reasons. But out of all the Green Lantern books, it was easily my favorite. The source of a Green Lantern’s power is his or her Willpower. But there are six other Corps, powered by different emotions: Rage, Greed, Fear, Hope, Compassion, and Love. So far, only Rage has gotten its own comic. The Red Lanterns are fueled by rage, which pumps their hearts and replaces their blood with acid. As a result, they are somewhat less than rational – with the exception of their leader. The first couple issues feature Atrocitus redefining his raison d’etre – from vengeance for him to justice for the victims of the universe. It’s a really interesting idea, but when most of the supporting cast can only speak in yells, hisses, and the occasional word, it gets a little old. I. Love. Superboy. He’s a clone of Superman, and he’s a clone of Lex Luthor. He’s trying to discover which “parent” he’s going to follow. He’s trying to discover if he has an identity outside of either. He’s a teenager with all of Superman’s powers, plus raging hormones. There’s something really endearing about him, that makes him one of my favorite heroes. Until now. The relaunch took him back to square one, as a creature grown in a vat. He seems to be even more powerful than before, but almost completely devoid of emotion. He lives in a tube, analyzing the world around him, and basically sounding like a computer. Except that sometimes he lives in a simulated Smallville, complete with crushes and homework and peer pressure, acting just like a normal kid. It’s jarring, and doesn’t make much sense to me. Ultimately, they took everything I loved about Superboy, threw it out the window, and started over with an awkwardly-written, unrelatable character I have no desire to interact with again. Easily my greatest disappointment from the relaunch. That’s right. Wonder Woman is suddenly AWESOME. By tweaking ONE thing about her, they have completely revitalized her, and opened up the door for endless villains, allies, and stories. Instead of being formed from a lump of clay by her mother, she is the illegitimate daughter of Zeus, who has been lied to her whole life. Now, she’s enemies with Hera. Now she’s sister to Hercules and Perseus and Strife and Athena, and SO MANY MORE. Now, she is the protector of Zeus’ latest conquest – who is being targeted by Hera as well. Wonder Woman has suddenly entered the most dysfunctional family in history, and it is fantastic. The story is dark and tense and mysterious and ominous and I really can’t praise it enough. OK, so I’m more or less over vampires. Which I say every year until True Blood comes back. So I was loathe to check out a comic called “I, Vampire,” despite the consistently stellar reviews I was seeing on the internet. But eventually [aka after I got a Kindle Fire] I decided I would download the first issue (for a dollar off regular price) and try it. And I actually really liked it. The story is about Andrew Bennett, and his progeny, Mary Queen of Blood. Andrew is an ancient vampire who basically hates vampires. He’s your classic Vampire with a soul. Or at least a conscience. Mary, on the other hand, woke up screaming about how she was going to slaughter all humans. So there’s that. Mary has been secretly creating an army of vampires. She is tired of cowering in the shadows from the superheroes – whose leader just happens to be SOLAR POWERED – and hopes to conquer. Her tone wavers between Marxist revolutionary/champion of the oppressed under class and the quintessential stalker ex-girlfriend. For even as she is sending an army to kill Andrew for his “traitorous” way of life, she is trying to seduce him and bring him around to her way of thinking. While this story hasn’t impressed me in the way Wonder Woman or recent Action Comics issues have, I do really enjoy it. It’s brilliantly executed and technically flawless, and the scope just keeps expanding with every issue as supporting cast is brought in and guest stars appear. This is definitely one to watch. OK, so even though I only tried nine or ten of the 52 different comics, I feel like I got a decent sampling. Overall, I would say the relaunch was a resounding success. For one thing, sales were HUGE, which is always nice to see. Many of the books are benefiting from the new status quo, and very few seem actively HURT by it. But the best thing about the reboot was the awareness it brought. It was talked about online and on the national news. If DC can just find a way to keep marketing their books and putting out quality product, I think they could turn around the comic slump.